Figure A22. Carlsberg anomaly, interpreted as the Carlsberg slab, with (horizontal) [vertical] cross sections through (A)[D] the UUP07 p-wave) and (B)[D] the combined SL2013 and S40RTS s-wave models at 1170 km; C) the location of the modern geological record that we interpret to have formed during the subduction of the slab. The Carlsberg anomaly (Figure A22) is detached and NNE-SSW trending below the northwestern Indian Ocean and was identified by Gaina et al. (2015) in the top of the lower mantle between 800 and 1400 km depth. The location and depth of the top suggest that the slab should be correlated to a geological record of past subduction in Late Mesozoic or Early Cenozoic time to the southwest of the Himalaya. Gaina et al. 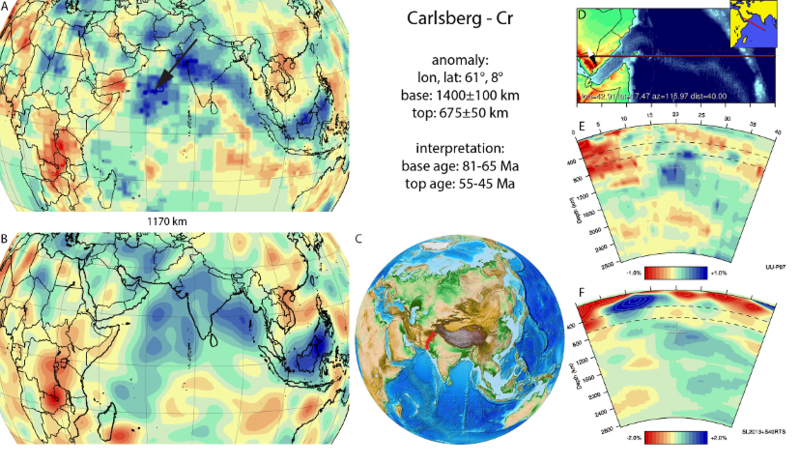 (2015) interpreted the anomaly as the Carlsberg slab that subducted as a result of highly oblique subduction of Indian lithosphere below oceanic lithosphere of the African (Arabian) plate in the Late Cretaceous to Paleocene. Initiation and arrest of its subduction is reflected in the geological record by formation and obduction of the Bela and Muslim Bagh ophiolites in Pakistan and the Kabul-Altimur ophiolites on the Kabul block in Afghanistan (Gnos et al., 1997; Gaina et al., 2015). The oldest radiometric age of supra-subduction ophiolites in western Pakistan that were interpreted to have formed above this subduction zone is an 80.2±1.5 Ma U/Pb age from a plagiogranite dyke (Kakar et al., 2012), whereas metamorphic soles below these ophiolites have 65-70 Ma ages (Mahmood et al., 1995; Gnos et al., 1998). We follow the interpretation of the Carlsberg slab of Gaina et al. (2015) and adopt a 73±8 Ma age range for the subduction of its base. The end of subduction is reflected by Eocene foreland basin deposits on the Indian and Arabian margin and overlap assemblages sealing the obduction thrust of ~55-45 Ma (Gnos et al., 1997; Khan and Clyde, 2013; Gaina et al., 2015).